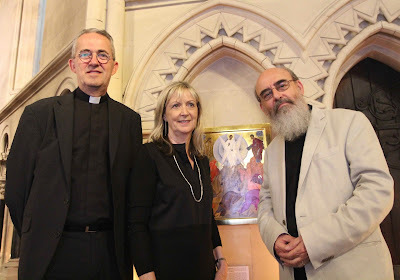 Dean Dermot Dunne, iconographer Adrienne Long and Canon Patrick Comerford at the launch of Christ Church Cathedral’s Icon Exhibition. Christ Church Cathedral is offering visitors the opportunity to engage with their spirituality on a different level through its Summer Exhibition of Icons. The exhibition, which features the work of iconographer Adrienne Lord, officially opened yesterday evening, June 22, and continues until the end of September. The icons are for sale and the proceeds will be donated to charity. The exhibition was launched by Canon Patrick Comerford, Precentor of St Mary’s Cathedral in Limerick and Priest in Charge of Rathkeale and Kilnaughtin Group of Parishes in Limerick. Canon Comerford has a keen interest in icons. He said that the word ‘icon’ had been demeaned in recent years – we have icons on our computers and we talk about people, such as film stars, in terms of being icons. However, he said Christ is the icon of God and the first icon is Christ. He pointed out that we do not worship icons but can be drawn into a spiritual experience by an icon. He said there was a temptation to look at icons as idolatry but this was not the case and neither is sufficient to look at an icon as a work of art without regard for its spiritual dimension. Canon Comerford paid tribute to Adrienne’s interpretation of the icons, which have mainly been inspired by Greek as well as some Russian icon writers. 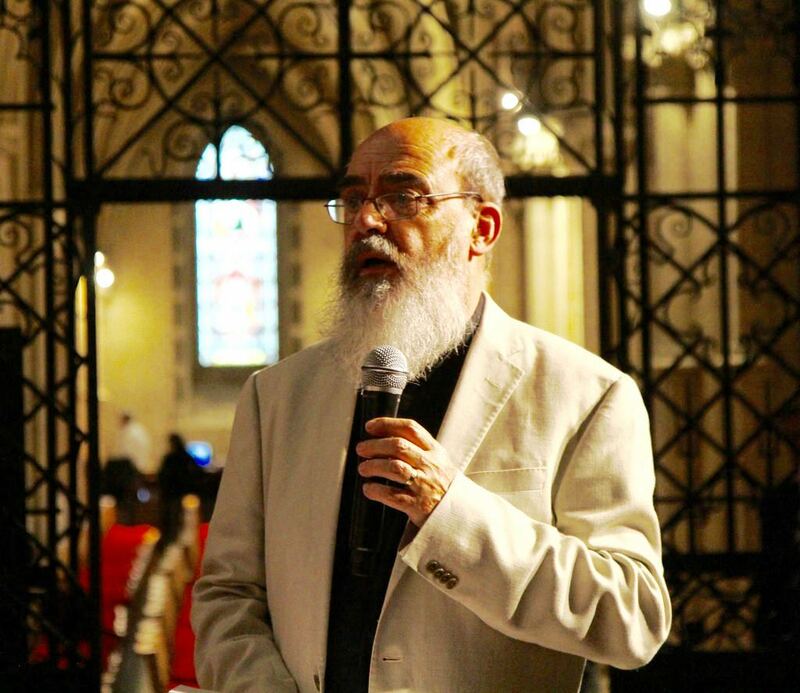 ‘These icons all give you the idea that we do not have a static relationship with God but rather a dynamic relationship with God … What you are looking at is an interpretation of art, beauty, dynamism and spirituality,’ he said adding that icon writers are among the first and last theologians because they allow us to speak about God but also to enter into a relationship with God. The cathedral’s Dean, the Very Revd Dermot Dunne, described Adrienne Lord as a prolific icon writer and said that her work had emanated from a spiritual heart of prayer. He commended her for her generosity in donating the proceeds of the sale of her icons, over and above the cost of writing them, to charity. A Triptych Deesis altarpiece, worth €1,000, will be raffled with the proceeds from the sale of raffle tickets going to SSPD, in Tamil Nadu, India, a non-profit, non-governmental organisation that works to improve the conditions of communities living in poverty in Tamil Nadu. The Dean encouraged everyone to buy tickets which are available at the welcome desk. The proceeds of sales made during the exhibition will go to a registered charity nominated by the purchaser. Sales of the icons on the opening night will be donated to one of four charities nominated by the artist. Throughout the exhibition’s run there will be demonstrations by the iconographer on the last Friday of each month between 11.00 am and 1.00 pm and 2.00 pm and 4.00 pm. This report was published this evening [23 June 2017] on the website of the United Dioceses of Dublin and Glendalough. To read this report and to view a full photo gallery follow this link.